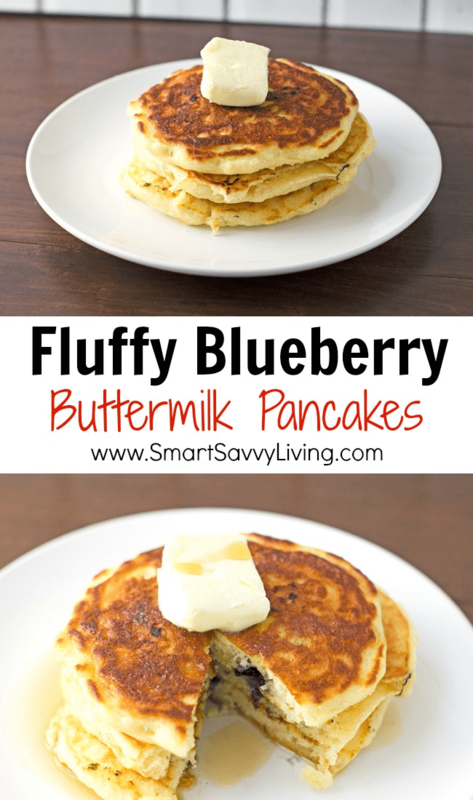 This fluffy blueberry buttermilk pancakes recipe is my definition of a perfect homemade pancake with an extra blueberry flavor boost. Growing up we had pancakes for breakfast a lot. Actually, I think we probably had them more often for dinner which made them all the more special. Looking back, I loved them at the time because, hello, I was a kid and pancakes! My mom always made them from a pancake mix that you just add water to and they were honestly rather bland now that I know what pancakes can really taste like. She basically fried them in oil and then they were covered in margarine and the imitation pancake syrup that might have once barely brushed against a maple tree in passing. Sometimes it’s a bit scary to look back on what you ate as a kid and loved because you didn’t know any better, huh? Anyway, these days I like to make my pancakes from scratch and one of my utmost favorites is using this fluffy blueberry buttermilk pancakes recipe. Yes, I do like a lot of butter. Don’t judge. It took me a lot of experimenting to make what I consider to be the perfect pancakes. Some were too thin and not very fluffy, while others were thicker but on the blander side. After some trial and error, I also found that the technique is very important when it comes to pancake texture. For example, sure, you can use buttermilk substitutions. 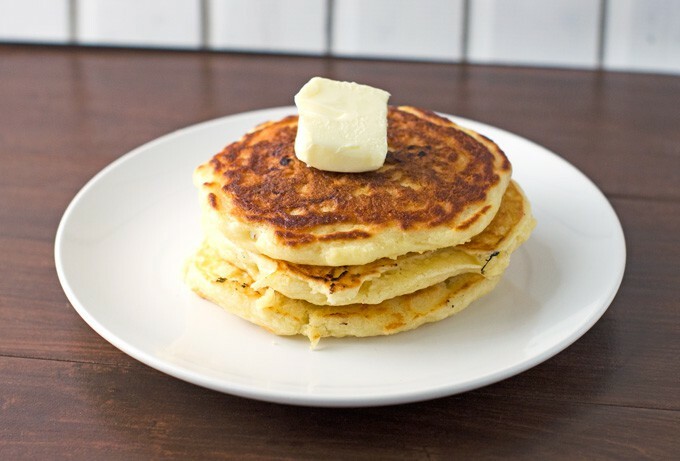 But, using real deal buttermilk not only makes for a tender pancake with good flavor, but it also helps the pancakes rise more and be fluffier. Resting the batter also helps the batter to be lighter and fluffier, along with the usual tip of not over mixing your pancake batter. I’ve tried making this recipe with regular milk mixed with vinegar or not letting the batter rest and they just aren’t the same. 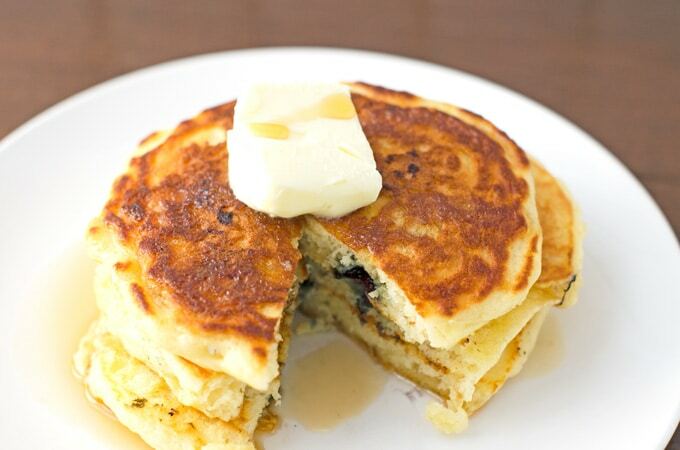 So, if you try this recipe for fluffy blueberry buttermilk pancakes, make sure to follow the directions as closely as possible to get fluffy pancake perfection. I’m already craving these pancakes again just talking about them. I guess I know what’s on the breakfast menu this weekend! 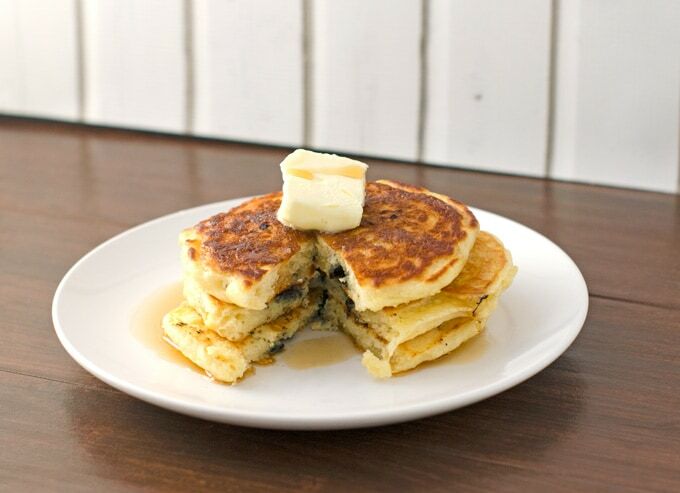 They’re quite delicious on their own, and even more with a big pat of butter and drizzle of real maple syrup. I generally like to serve them with bacon or sausage for some added protein. 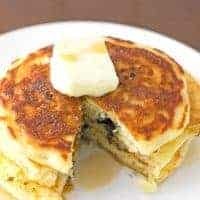 These blueberry pancakes also reheat and freeze well, so I’ll often make a double batch to eat for the next few days or freeze for the future. I’m often asked what products I use when cooking so here I share some of my must-haves to make these buttermilk blueberry pancakes. All of these items are used regularly in my kitchen. Batter bowl – Batter bowls are great to mix up cakes, whipped cream, and, of course, pancakes. Cookie or ice cream scoop – I like using a heaping large cookie scoop for measuring out the batter to make the pancakes as close in size as possible. The pancakes are on the smaller side, but cook faster and are less tedious to flip. A griddle – I wanted to love my large griddle pan, but at the time I had an electric coil stove that couldn’t heat the pan evenly. For several years I’ve had a Cuisinart Griddler that I adore making pancakes on because you can set and forget the temperature. I also like that you can buy waffle plates for it and have one less appliance taking up room! Here’s my favorite waffles recipe. A large turning spatula – This tool will lead to a lot less spilled batter and ugly pancakes due to failed flips. Real maple syrup – It should be a crime to not use real maple syrup on pancakes this good, in my opinion. Maple syrup can be a bit on the pricey side, but a little goes a long way and you can usually find pretty decent deals on Amazon or at your local warehouse stores. Melt the butter in the microwave or a small pot and allow to slightly cool while putting the rest of the ingredients together. In a large bowl whisk together the flour, sugar, baking powder, baking soda, and salt until thoroughly combined. In a medium bowl or 4-cup measuring cup measure 2 cups of buttermilk and then add 2 large eggs, vanilla, and cooled butter. Whisk together until thoroughly combined. Pour the wet ingredients into the dry ingredients and whisk together until batter is mostly combined. You don't want to over-mix the batter. Some lumps are fine, but you also don't want big flour pockets that haven't mixed in. Don't mix in the blueberries. Let the batter sit for 15 - 30 minutes. I let my electric griddle heat up to 375F while the batter sits. On occasion the batter may get too thick while resting, just lightly stir in a tablespoon more of buttermilk if this happens. Once the griddle is hot enough, lightly oil or butter the surface and pour large scoopfuls of the batter, or about 1/4 cup each, onto the griddle. Leave about 1 inch of space in between each pancake. I get 6, 3 on each side, onto my Cuisinart griddle. Sprinkle about 1 tablespoon of blueberries onto the pancake while it cooks. Let the pancakes cook for 1 - 2 minutes, or until you see bubbles forming in the middle of the pancake. You can check after a minute or so to see how brown they are, but you don't want to constantly poke them. When ready, flip the pancakes and let them cook approximately 1 more minute, or until the second side is browned. To keep the pancakes warm while you finish cooking the rest, place them on a baking sheet and in an oven on the warm setting, or about 200F. Leftovers can be stored well wrapped in the refrigerator for 2 - 3 days, and longer in the freezer. Reheat in a 350F oven for around 5 minutes after being thawed.